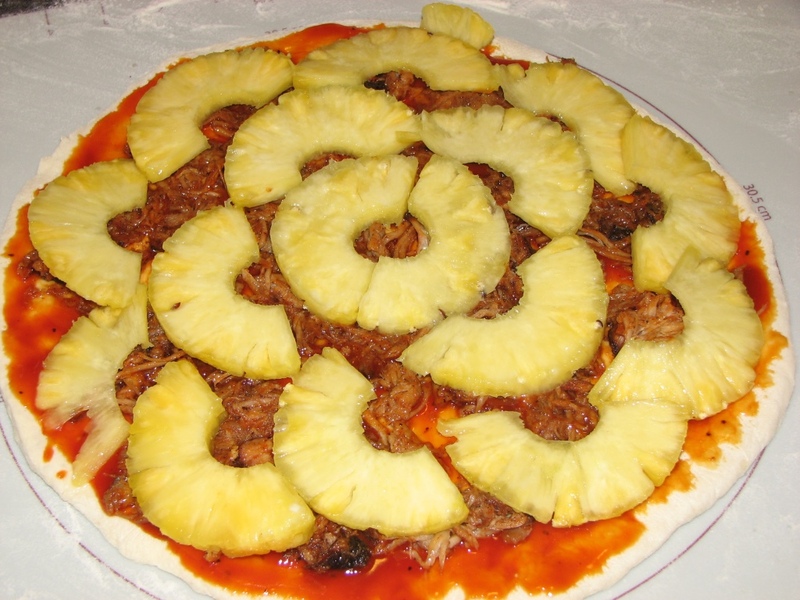 Pulled pork and pineapple pizza… say that fast 10 times!! This was the first non-traditional (ie. 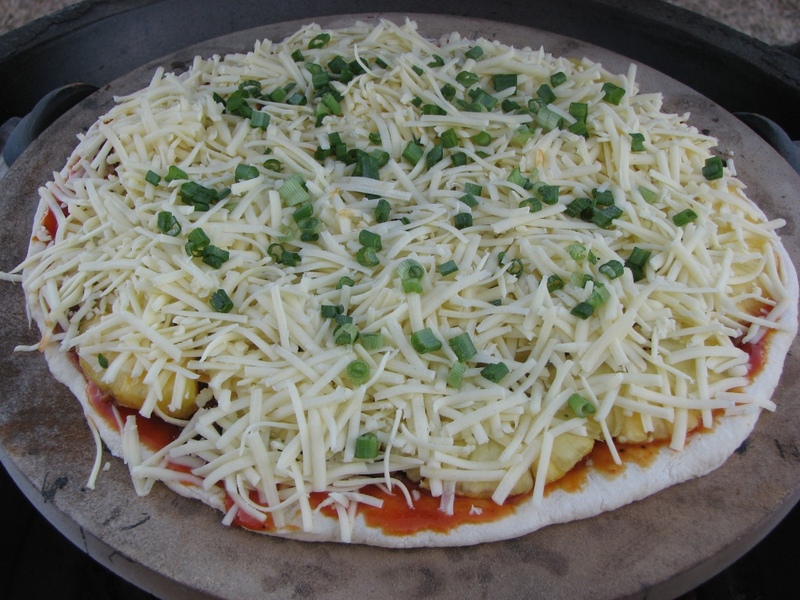 not tomato sauce based) pizza we ever made on the Big Green Egg. And we’ve never looked back. You’ll need to get your hands on some pulled pork – but hey, if you own a BGE, then you can just smoke a pork shoulder yourself and there you go!! Actually we don’t smoke a pork shoulder every time we want a pulled pork pizza, but when we do smoke a pork shoulder, we reserve some of the pulled pork and freeze it for just such an occasion as pizza night. You should do the same and you’ll always have some pulled pork on hand when you need it. It’s not just good on pizza, try it on a Caesar Salad, or in your mac and cheese… but I digress! Once you’ve rolled out your dough, spread some bbq sauce, then toss some more sauce in with the pulled pork and spread that around on the pizza. 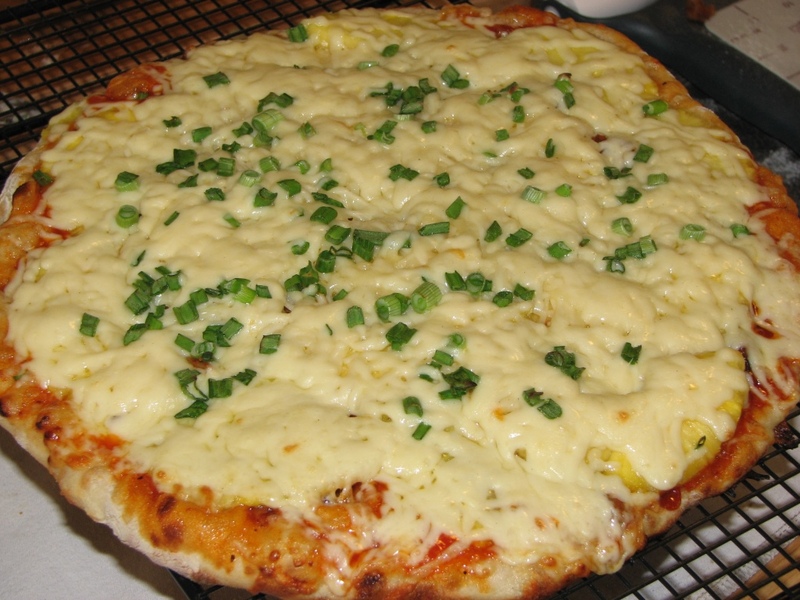 Put your pineapple slices on and top with the shredded cheese. Then bake the pizza in the BGE on the preheated stone at 650F for 4 to 5 minutes or until the bottom of the crust is browned and crispy. Keep an eye on it, pizza can burn quickly at high temperatures. Cool on a wire rack before cutting and serving. This helps it stay crispier while cooling if the air can get under the crust. Variation: if you don’t have any pulled pork on hand, substitute shredded chicken. It’s delicious too!